Yesterday was Day 7 of the SNAAARKM challenge and I did not post a manicure. The main reason: I fail at water marble. Now this isn't your "oh ha ha i'm sure you're great at water marble but only you don't like it" fail, this is literally a fail, fail. I waste loads of polish and time trying to attempt this technique. For those of you who do not know what water marbling is, please see the video below. I'm sure though that many of my fellow nail bloggers will read this post and quickly relate. Oh CutePolish, how I love you, but your video crushed my water marbling dreams. I successfully attempted water marble once in my life. Once. Okay, that's a lie, I got it twice, but the second time wasn't on my own nails and it wasn't the most impressive. It took forever to accomplish and we wasted a ton of polish. The first time can be seen here. This was my second attempt on a girl my best friend baby sits for. 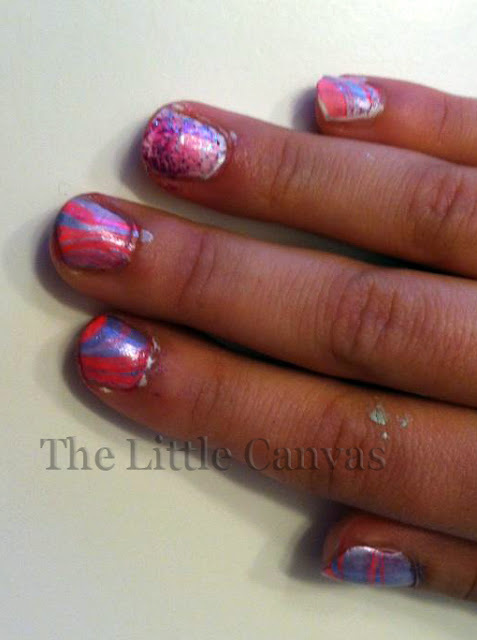 The ring finger is a gradient of colors the girl wanted sponged on her nail. I was happy she didn't want all nails marbled because I was getting exhausted just doing the 8 I had to lol. When this challenge started, I was excited yet nervous to attempt another water marble. I had dreams that it was going to come out perfectly and be the best water marble yet. It was going to be one of those water marbles pinned on pinterest that gets 500 re-pins. Sadly though, yet again, my dreams were crushed as soon as I sat down. I had selected three colors, a pink, blue, and purple, which in the bottles side by side looked beyond amazing together. I started dripping, and the polishes began doing their little bulls eye thing. I was all happy, excited, never had the polish spread out so lovely before. As soon as I took the tooth pick to it and draw the design, the polish was dried and it was impossible to draw anything into it. It all gathered onto the tooth pick and in two seconds, my beautiful bulls eye was gone. I didn't let that get me down, I tried another time, it did the same thing, and another, same thing, another, same thing. Finally, I used two colors, the purple and the blue, since I thought I was spending too much time adding all the colors. It sort of did the same thing but I was able to draw a design. I marbled my finger, and guess what happened, I had about a million little water bubbles that made the nail look like it was diseased. After attempting about 5 more times, I finally gave up, grabbed the bottle of acetone and angrily removed the failed attempt. Despite having a clear and white base coat, my nails still were stained for the failed attempts. To remove the stain, I was forced to cut my nails to the shortest they have been in the longest time. While I don't have the longest of nails, these were baby nubs which I hate. They're starting to grow back, but not quick enough. This final attempt of water marble was traumatizing to say the least. First - Know your polish - Polish Groupie had a great post on her blog entitled Water Marble Lessons Learned which I could relate to. When I water marbled the neighbor girls nails, I used some polishes which I had never used before. Just as Polish Groupie found out, this was a huge mistake. If you're going to water marble, make sure that you've used the polish before, and know if it is a sheer or opaque polish. I have found that the more opaque formulas tend to work better. Sheer ones tend to disappear in the water, and are barely visible on the nail when the marble is complete. Second - Work fast, but not too fast. The faster you work, the more likely the polish will not be dried when you go to draw in it. Do not work too fast though because that's when mistakes happen. You can end up spilling polish or dribbling it everywhere (like I tend to do). Third - Drawing the Design. Draw from the center of the design out, but do not touch the outer edge of the bulls eye and draw it back in. The outermost circle of the bulls eye is going to be the one that dries first. If you drag it towards the center and it's dry, it's going to clump up and ruin the rest of the design. Fourth - temperature is key. Room temperature water is the way to go. If the water is too cold, the polish tends to dry faster. If the water is too hot, I have found the polish won't spread, and instead will sink. Fifth - It's all about the Brand. Cheaper polishes tend to not work. Which is a shame since majority of my collection is Sinful Colors. I have found that OPI and China Glaze work the best. I hate using these polishes though because you are throwing your money away with how much polish you have to use. With that, I have come to the end of my water marble ranting post. I hope you enjoyed it, or have had similar experiences. I am sorry to my SNAAARKM girls that I was unable to complete the challenge. I had a blast though the other 6 days. To everyone else, have you ever tried water marble? What have you found to work or not work? Even though I'm not planning on ever attempting this technique again, I'm interested in seeing what others have found to work/not work. I think your marble turned out good! You just need practice. It is just so damn hard. I laughed out loud about the pinterest comment. I did a water marble last week that actually came out decent. I saw that someone had pinned it and I almost died. 1 not 500 but I was still overjoyed. It was my fourth try. So keep at it. it is!!!! and everyone makes it seem so simple, then i feel stupid when I can't complete it! I just received 92 repins on my lilac nails and I was beyond thrilled!!! Never been happier. I just really thought this marble would have been my pinterest break out! I saw your water marble on your blog and you did amazing!!!! i was jealous! Well I've managed to do a successful water marble a couple of times but I never tried doing all 10 fingers. I also just used cremes. I haven't ventured out to try to do more. Both times just took a lot of trial and error and it is very frustrating. lol. Yay I'm finally reading the much-anticipated rant post! Hahaha. Yknow some nail art just isn't for everyone. I can't freehand at ALL and marbling isn't my strong suit. I don't even like it that much cuz althought I don't have many problems dragging the polish and I have used a shot glass so I minimize waste- there's still a ton of waste and even if I oil or Vaseline my fingers I'm still a giant mess. Ew. Idk if I'll ever try another water marble either. I feel you 100%! I can't do water marble to save my life. Hours and hours wasted and tons of nail polish as well. It's so cool looking...when it works. I envy ALL those who can do it, I truly do. haha. Perhaps if we keep at it, well get it down. Does sinful colors work? Have you tried it? I have not. At least they are on the cheaper side. Love this!! I actually learned all the things I did wrong, so your attempt was not in vain. I will most certainly NOT be trying water marbling again.